Cusco is a beautiful an ancient city. We were blessed with a beautiful view of the Moon and Venus on our arrival. 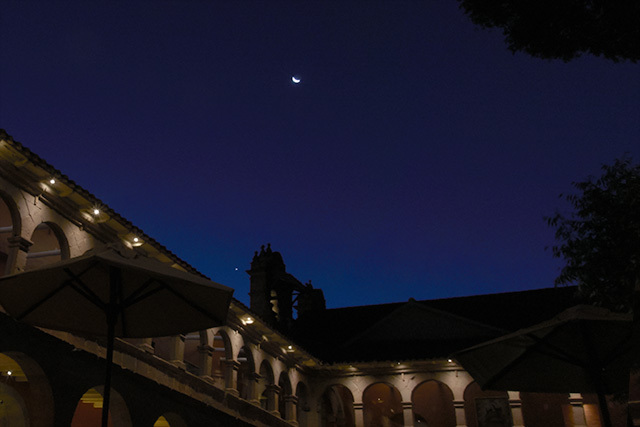 This shot shows them over the bell tower at El Monasterio from the main atrium. El Monasterio is just a couple of blocks from the central Plaza de Armas on 2018-05-18. Our busy trip left little time for astrophotography, my Sony RX100 coat pocket astrophotography kit was perfect. Single image exposed for 0.5 sec at f/2.8 and ISO 400 with a 24mm equivalent zoom. Crop and minor exposure adjustment in Photoshop.